A 39-year-old man in Giong Trom district in Ben Tre province was confirmed to die after catching an influenza A(H3) virus, said Deputy Director of the Department of Health Vo Hong Khanh on September 11. Before, the man went to the nearby drug store to buy over-the-counter medicine for self-medication when he experienced fever and cough on August 23; however, his condition did not abate. He accordingly arrived at a private clinic for further treatment. Two days later, he was hospitalized in local medical clinic which soon transferred him to bigger hospital when he had breathing problem and his heart stopped beating two times. In spite of intensive care , the man was still in critical condition; at last he was taken to the Tropical Disease hospital in Ho Chi Minh City where he was diagnosed to have breathing problem, septic shock, serious pneumonia, electrolyte disorder and Gastroesophageal reflux. Scan results showed his left lung was whiteout and he was positive for flu A/h3 virus. According to his relative, he does not have heart disease and diabetes yet he underwent an operation three years ago. He earns living by raising poultry and transporting the animal to sell. 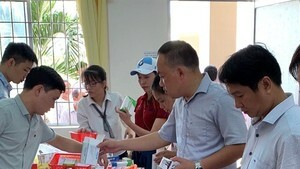 At present, the health sector of Ben Tre has implemented measures against flu.